An elderly man is furious after he complained about a bus shelter which leaks water but nothing has been fixed for nearly six years. 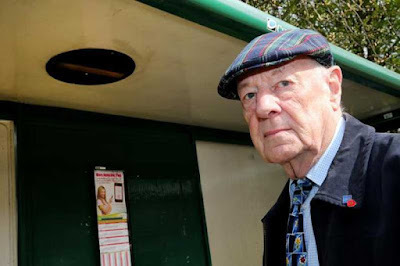 John Brown, 86, of Borehamwood, contacted Hertfordshire County Council in 2010 regarding the state of the bus shelter in Aycliffe Road. According to Mr Brown, the bus shelter has a leak in the roof that causes water to leak through on both rainy and sunny days. But despite his complaints, the problem has remained unfixed. He said: “I find it unacceptable that people who are waiting for buses are subjected to rain water. Nothing has been done to properly sort it since I spoke to the council. I am getting fed up with it. On multiple occasions I have been subjected to rain water and around two or three times I have had a wet behind because I sat on one of the seats. It has got to the stage that I am at the end of my tether.” According to Mr Brown no-one can sit on the seats because they are always wet and the council have not fixed the roof since before 2010. Mr Brown added: “The county council do not want to know. I complained nearly six years ago. If they do not fix it I will refuse to pay my council tax. I know they would be very quick to get in touch if I did not pay it but they still have not done anything. Why do not they do something about it? I want to shame the council into fixing it.” Mr Brown is also complaining about the position of the bus stop. He believes if people are sat down the bus drivers cannot see them and sometimes they do not stop.